Most of the people to emigrate from Ayrshire settled in America, Australia and Canada. If you are looking to find information on anyone, in Ayrshire or abroad, you can post a message with as much information about them as you can, hopefully, someone will then be able to give information on the person you are enquiring about. An interesting website with a list of ships with their passenger lists that carried emigrants to the US, Canada and Australia between 1685 and 1903 is www.scotlandsfamily.com. Records of ships and their passengers before the 1890s can be hard to find. Records of Births, Deaths and Marriages dating back to 1855, in South Ayrshire, are held in four Registration Offices. We have a team of courteous and experienced staff who will be happy to offer advice and assistance with any enquiries you may have, website & contacts: www.south-ayrshire.gov.uk. Old Parish Records date from 1553 to 1854. Births Deaths and Marriages information for North Ayrshire from 1855 - present day, website: www.north-ayrshire.gov.uk. Old Parish Records date from 1553 to 1854. Births Deaths and Marriages information for East Ayrshire from 1855 - present day, website: www.east-ayrshire.gov.uk. Old Parish Records date from 1553 to 1854. East Ayrshire is from Kilmarnock to Cumnock in the east. North Ayrshire is from Irvine to Largs in the north. South Ayrshire is from Troon and Ayr to Ballantrae in the south. Just wondering if anyone has any additional information on: Richard Youngest Son" WALLACE son of Richard WALLACE Laird of Riccarton and Margaret BUCKINGHAM was born circa 1211 in Riccarton, Ayr, Scotland and died in Scotland. Richard married Elizabeth CATHCART, daughter of William de CATHCART and unknown. Richard I understand was my 25th Great-Grandparent. Adam "The Eldest" WALLACE son of Richard "Youngest Son" WALLACE and Elizabeth CATHCART was born in 1220 in Riccarton, Ayr, Scotland and died in 1246 in Scotland at age 26. 24th Great Grandparent Sir John WALLACE son of Sir John WALLACE and Elizabeth EGLINGTON was born in 1315 in Riccarton. John married Margaret LINDSEY Heiress of Craigie, was born in 1320 in Craigie, Ayr, Scotland 21st Great Grandparent I have always been of the understanding the William WALLACE was my family, however, as most people would realise is is difficult to find and definite information on him and parentage. I was hoping someone could shed some light on it foe me. My family later moved to County of Tyrone, Northern Ireland around 1660 - later moving to Australia. Email: gailsproule@hotmail.com any information would be wonderful to receive. Regards Gail. Sarah Printer Close info image. I am trying to find out John Patrick of 1429 Ayrshire or Edinburgh Scotland is listed as dead 1463 Ayrshire Scotland, Parents name , where they are from. John was a notary, this job in that time would be in high demand from Nobles, Churches, Courts and such it was an educated occupation, some think he must have been schooled in England. ..but everyone has hit a brick wall and unless we find out at least a fathers name, we can go no further...there has to be school records, royal records, church records, birth records, death records, census records, tax records. ..somewhere we just can't find them, and by the word we..I mean hundreds of people hitting the same brick wall...he has a son John Patrick Jr, 1460 Edinburgh sScotla. died..1498 at age 38..can you please help. Email: jackie.white4026@ymail.com . Searching for Craig Grant son of John Grant. You came to Tacoma Washington, USA as an exchange student. I would love to hear from you again. Email: Joananelson@msn.com . I'm trying to gain information about 3 older sisters of my grandfather. Their names were Jeannie, Agnes and Margret McGill. I have census records dated from 1891 that show that Jeannie was 21 at that time...the two others were 19 and 18 respectively and unmarried. A family member, who gave me these records, said he'd heard that the 3 woman came to the USA in late 1890's or early 1900's to the northern Ohio area. These ladies would have been my fathers aunts as their younger brother was my grandfather. Somewhere in my grandfather's history, he changed his name to Templeton which is my last name. Any information would be appreciated. Thanks. Email: dtempleton987@gmail.com . Hello - though I have lots of Ayrshire relatives on my Anderson side (and of course would love to find out more / contact living relatives) I am searching for connections on the Sinclair side of the family. 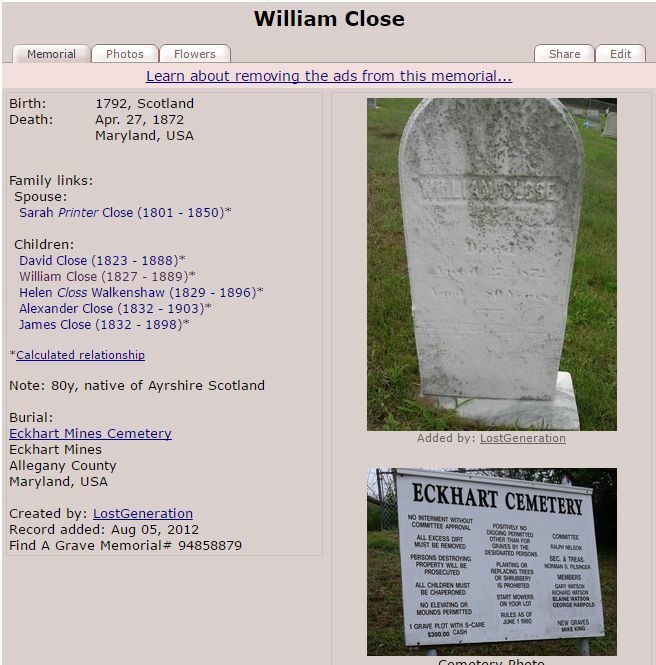 An aunt, Sarah Sinclair Gray (husband William) appears to have lived in this area and passed in 2002. Her sister Christina Sinclair Cornock also seems to have a connection (husband Robert Cornock). Their parents were Sarah Preston & John Sinclair (Glasgow). Years ago I met some of the family who visited Canada but it seems contact was lost. I'd appreciate any help in filling in the missing pieces to our family tree. Kind Regards Kim. Email: horsemom91@rogers.com . For any Crawford's interested in tracing their Crawford families origins, The clan Crawford association has launched a new Facebook site to help their members with their ancestry research & also to help them understand what their DNA test results mean if taken, Clink on the link below to become a new member, They'll be delighted to hear from you. Facebook Page. Greetings, I am researching my family genealogy. John Murdaugh 1750-1852 born Ochiltree, Ayer. Samuel L. Murdaugh Murders 1793. 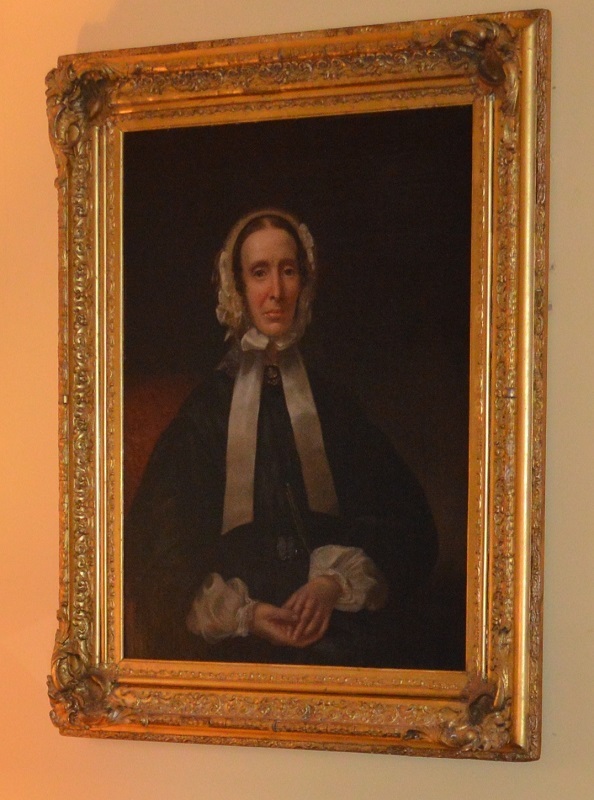 Elizabeth Smith 1761-1852. George Murdoch 1715-1756. Margaret Leitch 1716-1756. If you can assist my search that would be such a blessing. Karen Strickland Kramer granddaughter of Nora Elizabeth Murdaugh. Email: galadrielthoman@gmail.com. My sister and I look forward to visiting Ayrshire during our upcoming trip. We are descended from the de Ross family and are interested in finding more information about them, as our efforts from the US have reached a stopping point. We know that our branch of the Rosses descended from a James Ross who left Scotland for Ireland in the 1600's, and he was descended from the de Rosses of Ayrshire, specifically, we think around the area of North Kilbride. Email: mookienc@hotmail.com Thanks Dr. Connie Ross. Tannahill DNA Project, United States - Seeking Tannahill DNA from Scotland! Greetings All, my name is David Tannahill, co-Administrator of the Tannahill-Tannehill DNA Project in the United States. We have two different Tannahill DNA lines from our Tannahill Project members who have tested their DNA with us. Strangely both seem to be coming from the same T-hill family line during the late 1700's and early 1800's out of Maryland, Delaware and Virginia. There can only be one!!! Actually, it is possible for there to be two DNA lines but not likely from the same township and/or family line. Since both DNA lines here want to claim Kilmarnock, let us think on that one. Now wouldn't it be a curiosity if another Scottish area claimed one or both lines. We now need DNA Project members from Scotland! Our Tannahill families have an illustrious history here in America as frontiersmen and pioneer planter families who helped clear this wild land and settle many parts of early America. Land grants were given to these early Tannahill families as reward for their military service as Indian fighters and Revolutionary War soldiers who fought gallantly in America's struggle to become a new Nation. These T-hill families migrated into South Carolina, Georgia, Alabama and Texas as well as Tennessee and Kentucky, Missouri and all the Great Lakes territorial states. It is now the purpose of our Tannahill-Tannehill Project (both spellings are used here) to reach out and find which is the original Tannahill DNA line that is native to Scotland's Ayrshire region and in particular, the Kilmarnock area, where these family traditions have it as the Tannahill homeland. Is there another area in Scotland where Tannahill families also originated? We want to learn more about our family history in Scotland and the British Isles, therefore we welcome Tannahill-Tannehill family members from all areas of Scotland, Britain and Northern Ireland to join us. Family Tree DNA in Houston, Texas is our testing company for our DNA research. While FTDNA has several DNA tests for both men and women, it is the Y-DNA test (male lineage) that we are now using for this research. So if you are a male Tannahill-Tannehill or know of one who would be interested in participating in our DNA research we would be very happy to have you join our Project. Please contact me for more information, I'm looking forward to hearing from you! 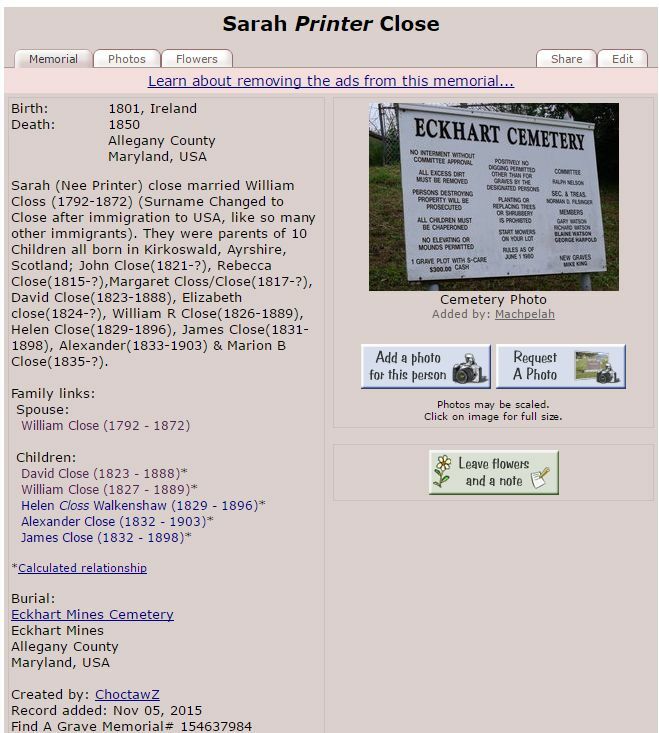 Seeking family of Edward Johnston, (1910-1996), married to Annie Adam Walker Young. Edward would be my great uncle, his sister, Georgina Johnson (Watson, Banks) was my grandmother. I am interested in making contact with descendants of Edward. Please contact Donna Turner at Email: we3turners@gci.net , or 20428 New England Drive, Eagle River, Alaska, USA 99577. Hello, I'm trying to research my family's ancestry, and I've hit a snag. It stops with a William Boyd, born in 1846 in Stevenson, Ayr and has him residing in Kilwinning, Ayrshire. It also has him married to a Sarah S. Johnson. Any information you may have would be greatly appreciated. Thank you! Robert Cochrane born 1829 Ayrshire, married Jean Unknown born 1839 Ayrshire, Brother: Thomas Cochrane born 1841 in Ayrshire. Looking for name of Robert & Thomas Cochrane's Parents. Looking for Jean's Surname & Parents, Regards Lynette. 3 F ii. Ann J. Thomas-289 was born 23 Jul 1861 in Muirkirk, Ayrshire, Scotland. She died before 1871. 5 F iv. Helen ( Ellen Ston) Thomas-11292 was born 14 Dec 1868 in Muirkirk, Ayrshire, Scotland. Helen married Michael Fox . Michael was born 1871 in Longriggind / Glenmavis, Lanarkshire. He died 1949 in Larkhall, Lanarkshire, Scotland . Helen also married James Fox son of Matthew Fox and Mary Dolan on 31 Dec 1891 in Muirkirk Ayrshire Scotland. James was born about 1868 in West Calder, Edinburghshire, Midlothian, Scotland. 6 M v. Peter Thomas was born 6 Oct 1866 in Muirkirk, Ayrshire, Scotland. He died before 1870 in Muirkirk, Ayrshire, Scotland. 7 F vi. Mary Thomas was born 6 Oct 1866 in Muirkirk, Ayrshire, Scotland. She died 24 Jan 1893 in Cumnock, Ayrshire ( East Ayrshire), Scotland. Mary married Robert McAllister son of Robert McAllister and Rosanna Devlin on 26 Jun 1884 in St.Thomases, Muirkirk, Ayrshire. Robert was born 4 Mar 1861 in Townfoot Cumnock / Old Cumnock, Ayrshire, Scotland. He died 18 Sep 1915 in Railway Station Kilmarnock, Ayrshire, Scotland. 8 F vii. Margaret Thomas was born 13 Dec 1872 in Muirkirk, Ayrshire, Scotland. 9 F viii. Bridget Elizabeth Thomas was born 6 Nov 1874 in Muirkirk, Ayrshire, Scotland. Bridget married William Donochie , son of James Donochie and Sarah O'Hear on 13 Oct 1899 in St. Sophia's R C Church, Galston, Ayrsihre, Scotland. William was born about 1872 in Newmilns, Scotland. He died in Newmilns, Scotland. 10 F ix. Ann Jane Thomas was born 7 Sep 1876 in Muirkirk, Ayrshire, Scotland. Ann married Robert Higgins Robert was born 1877. 11 M x. Peter Thomas was born 9 Jan 1881 in Muirkirk, Ayrshire, Scotland. 12 F xi. Celilia Thomas was born 21 Dec 1883 in Muirkirk, Ayrshire, Scotland. Celilia married James Devlin , son of Hugh Devlin and Hannah Ms Hugh Devlin James was born about 1882 in Glasgow, Lanarkshire, Scotland. He died about 1954 in Glasgow, Lanarkshire, Scotland. 13 M xii. Edward Minnie Thomas was born 3 Apr 1887 in Muirkirk, Ayrshire, Scotland. He died before 1891. 14 F xiii. Edith Thomas-473 was born 1888 in Muirkirk Ayrshire Scotland. 2 F i. Annie K Thomas-267 was born 7 Dec 1922 in Muirkirk, Ayrshire, Scotland. She died 28 Jan 2006 in Tampa, Hillsborough, FLordia and was buried in Rose Hill Cemetery, Petersburg, Menard, Illinois FAG# # 34967840. Annie married Dallas L Schaad son of Albert M Schaad and Lola B Thasher . Dallas was born 25 Aug 1917 in , , Illinois. He died 22 May 1988 in Petersburg, Menard, Illinois and was buried in Rose Hill Cemetery, Petersburg, Menard, Illinois FAG# 34967848. Tec 4 US Army Air Corps World War II. 4 M iii. William Gourlay (Bill, Scotty) Thomas Sr.-260 was born 7 Mar 1928 in Probably Muirkirk, Ayrshire, Scotland. was buried in Woodland Cemetery McHenry, McHenry, Illinois. Bill married Margaret Mary (Maggie) Hall- on 7 Mar 1953 in Muirkirk, Ayrshire, Scotland. Margaret was born 13 Jul 1931 in Londonderry, North Ireland. She died 27 Sep 2006 in Crystal Lake, McHenry, Illinois and was buried Oct 2006 in Woodland Cemetery McHenry, McHenry, Illinois FAG # 74568359. 5 M iv Janet (Jenny) Thomas was born 16 Apr 1930 in Probably Muirkirk, Ayrshire, Scotland. He died 11 Feb 2011. Janet married Walter Muir . 6 M v. Edward (Eddie) Thomas was born 21 Dec 1934 in Probably Muirkirk, Ayrshire, Scotland. 2 M i. William Walker Maxwell- was born 23 Dec 1860 in Durrisdeer, Dumfries, Scotland. He died Probably BEF 1871. 4 M iii. Alexander Maxwell Cannon- was born 28 Feb 1869 in Morton by Thornhill / Carronbridge, Dumfriesshire. 5 F iv. Jane Cannon was born 6/7 Jun 1871 in Muirkirk, Ayrshire, Scotland. 6 F v. William Cannon was born 22 Nov 1873 in Muirkirk, Ayrshire, Scotland. 7 F vi. Isabella Cannon was born 1877 in Muirkirk, Ayrshire, Scotland.